A recent Guardian newspaper article (CCTV in the sky: Police plan to use military-style spy drones, 23rd January 2010) reveals plans to use surveillance drones/Unmanned Aerial Vehicles (UAVs) to spy on UK citizens. The project, called the South Coast Partnership, sees arms manufacturer BAE Systems teaming up with a “consortium of government agencies led by Kent police”. The Guardian report states that: Police in the UK are planning to use unmanned spy drones, controversially deployed in Afghanistan, for the ”routine” monitoring of antisocial motorists, protesters, agricultural thieves and fly-tippers, in a significant expansion of covert state surveillance. The Home Office’s ‘Science and Innovation Strategy 2009–12′ , published last year, confirms that the UK government has been exploring the use of Unmanned Aerial Vehicles (UAVs) as a policing “tool”. Obtaining information about plans for civilian UAV deployment is not easy – the South Coast Partnership has no public website, appears to publish no documents and has not been discussed or debated in parliament – it operates below the radar of the public that it is the intention to surveil. As a result this article has been pulled together from a variety of disparate sources including many mainstream newspaper articles rather than original source documents. It is hoped that this patchwork of information will at least serve as a preliminary overview of this expanding field. From 2012 fully autonomous unmanned air systems could be routinely used by border agencies, the police and other government bodies. These systems will be fully autonomous so that operators task the vehicles and receive the relevant imagery and intelligence direct to the ground control station in real time. It is understood the police have expressed interest in using the £5m drone to monitor crowds during demonstrations and events such as football matches. The Sunday Times article also revealed that one of the UAVs being adapted by BAE Systems for the South Coast Partnership is the High Endurance Rapid Technology Insertion (Herti) which will fly above 20,000ft, with cameras powerful enough to see humans on boats as if they were a few feet away and capable of taking pictures in darkness using night vision lenses. Until now they have largely been the preserve of the generals. The US military routinely uses them over Iraq and Afghanistan. But now the world’s aerospace companies reckon they can make money by selling them to civilians too, for a wide range of tasks such as traffic control, border patrols, or crop and drought monitoring. You’ve got to. Yeah okay, it’s gonna weigh on your mind and then I’ve got a 45 minute drive home, so I just stick the radio on, listen to a podcast, whatever – just drive home and then by the time I’m home I’m kind of straight into family life. The proposed use of adapted versions of this controversial military hardware by government agencies and the police to monitor their own citizens clearly goes further to blur the distinction between the military and civilian law enforcement; the police are being equipped as a de facto army against the people. It is an obscene abuse of power – the replacement of policing by consent with policing by remote control. In his 1929 book ‘The New Despotism’ then Lord Chief Justice of England, Lord Hewart coined the phrase “Administrative Lawlessness” to describe a worrying trend in English politics at that time – the exercise of arbitrary power, where decisions are made in secret, not based on evidence and without proper debate. The secret development of CCTV UAVs or drones by bodies such as those in the Home Office backed South Coast partnership represents yet another step towards completing the forewarned Administrative Lawlessness now evident the world over as civil liberties are squandered. It is not just in the UK that the use of surveillance drones has been secretly developed. Montalvo told reporters the unmanned aircraft would be used for “mobility” or traffic issues, evacuations during storms, homeland security, search and rescue, and also “tactical.” She admitted that could include covert police actions and she said she was not ruling out someday using the drones for writing traffic tickets. Professor Stephen Graham of Durham University  (”Cities and the ‘war on terror’”, International Journal of Urban and Regional Research, 2006) describes how the US administration has securitized the everyday urban spaces where “all-pervasive discourses of ‘homeland security,’ emphasizing endless threats from an almost infinite range of people, places and technologies, are being used to justify a massive process of state building”. This process involves deepening state surveillance, repression and violence against those seen to harbour ‘terrorist threats’, combined with radically increased efforts to ensure the effective filtering power of starkly reinscribed national, infrastructural and urban borders. After decades where the business press and politicians endlessly celebrated the supposed collapse of boundaries (at least for mobile capital) through neoliberal globalization, ‘in both political debates and policy practice, borders are very much back in style’. Since 2002, for the first time, fleets of apparently identical US unmanned aerial vehicles (UAVs) have indeed patrolled both the increasingly militarized border of the Southern United States and the cities and frontier lands of the war zones of the Middle East. Identical, that is, except in one crucial respect. Tellingly, in the former case, however, worries have been expressed about the dangers of accidental crashes from unarmed drones flying over the US’s civilian population by Federal aviation safety officers. The Welsh Assembly Government has identified the UAS [unmanned aircraft system] sector as an area with potential for significant economic impact for West Wales. To that end ParcAberporth was developed by the Welsh Assembly Government in 2003/04 as a Centre of Excellence for leading aerospace companies involved in the research and development of UAS. According to the 2009/2010 UAS Yearbook  a partnership has been set up with the Ministry of Defence (MOD) Aberporth, West Wales Airport and the West Wales UAS centre to create the Wales UAS Environment and “West Wales Airport is the only site in the UK able to undertake routine operations of civil and military UAS operations and the only UK airport to have a UAS Operations Manual accepted by a civil regulatory authority”. 50,000 people live under the new 650 sq mile UAV testing zone. Two drones have crashed in the first months of flying out of Parc Aberporth so there are great concerns about safety. Operators will have to abide by a “code of practice” on privacy, but the MOD will be the main user and they are unlikely to be accountable in the same way. Much of the good humoured banter generated in and outside the hall related to the inexorable approach of the UAV. Everyone was agreed that, industry aside, this spectre is still sufficiently distant to be largely discounted but here as everywhere it intruded into most conversations and finally became the object of humour. As is becoming increasingly clear in the day to day information gathering for PAN the subject simply will not just go away. There was evident hostility from the pilots to the newcomer – although most were agreed that the chances of such craft actually replacing air support as we know it were very slender. As has been proven recently the biggest danger appears to lie in potential air unit operators ‘making do’ with unmanned vehicles in the mistaken belief that a UAV can replace manned craft. They are aircraft but in reality those seeking to operate them are not of the current aviation fraternity. [...] There were certainly few real UAV fans in the Congress Centre. Please help us in this work with your donation. Contribute to the fund for the purpose of stopping the misuse of this technology beyond the coverage of normal laws. The money donated to the fund will used for the purpose of introducing legislation designed to restrain the illegal use of drones. A powered, aerial vehicle that does not carry a human operator, uses aerodynamic forces to provide vehicle lift, can fly autonomously or be piloted remotely, can be expendable or recoverable, and can carry a lethal or nonlethal payload. Ballistic or semiballistic vehicles, cruise missiles, and artillery projectiles are not considered unmanned aerial vehicles. Also called UAV. A land, sea, or air vehicle that is remotely or automatically controlled. See also remotely piloted vehicle; unmanned aerial vehicle. That system whose components include the necessary equipment, network, and personnel to control an unmanned aircraft. Also called UAS. 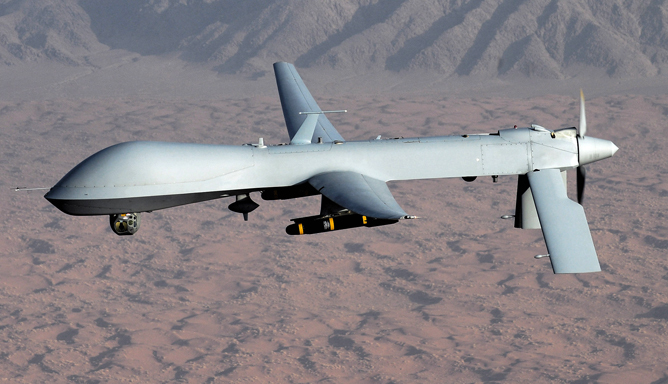 "Military drone attacks are calculated to kill 50 civilians for every combatant killed." The rapid expansion of drone technologies is being pushed for by a veritable super consortium of arms companies, UK government agencies and universities, under the name Astraea (Autonomous Systems Technology Related Airborne Evaluation & Assessment). These include: BAE Systems, Thales, Rolls Royce, Agent Oriented Software and QinetiQ; the South West of England Regional Development Agency, South East Economic Development Agency, Scottish Enterprise and the North West Regional Development Agency; and the universities of Loughborough, Sheffield, Lancaster and Aberystwyth, among others. State involvement in Astraea is ‘led’ by the Welsh Assembly and, as such, Astraea receives half its funding from the public sector, constituting £16 million in total. Further evidence of the financial rewards expected by members of the UAV industry is the scale of events, conferences and exhibitions staged around the world. Events in the UK such as the Bristol International Remotely Piloted Vehicle (RPV) Conference  and the ParcAberporth Unmanned Systems demonstration and exhibition ; and in the United States – the Kansas UAV Symposium  and ‘AUVSI’s Unmanned Systems North America’  described as “the World’s Largest Unmanned System Conference and Exhibition”, which this year will take place in Denver, Colorado. Despite the enormous profits the UAV corporations can generate from their hugely expensive toys these events it seems think nothing of taking tax payers money. The 2007 ParcAberporth Unmanned Systems demonstration and exhibition event received £181,145 from the Welsh Assembly government for “Showplace Hospitality Suites”, “consultancy service” and “provision of services for the direction and management of the flying/ground demonstrations and associated rehearsals” . What Londoners need to be aware of is the pressure that’s being exerted behind the scenes by companies which have gotten a taste of the super profits in China, in the name of Olympic security, and they’re going to be selling the same model now to any city that hosts the games. The Utilitarian philosopher Jeremy Bentham (1748-1832) proposed a model prison called the Panopticon (”all-seeing”) which functioned as a round-the-clock surveillance machine. French philosopher Michel Foucault describes the implications of the Panopticon: “So to arrange things that the surveillance is permanent in its effects, even if it is discontinuous in its action”. Drones that fly at 20,000 feet, that cannot be seen or heard from the ground would constitute another brick in the Panopticon prison that is being steadily built around us – unless we speak out and start taking the bricks down. The problems of our society require more human interaction, not less. Silent, invisible CCTV drones should remain the stuff of science fiction novels – they have no place in a free country. It is better that the community reduces crime, this technology does not.